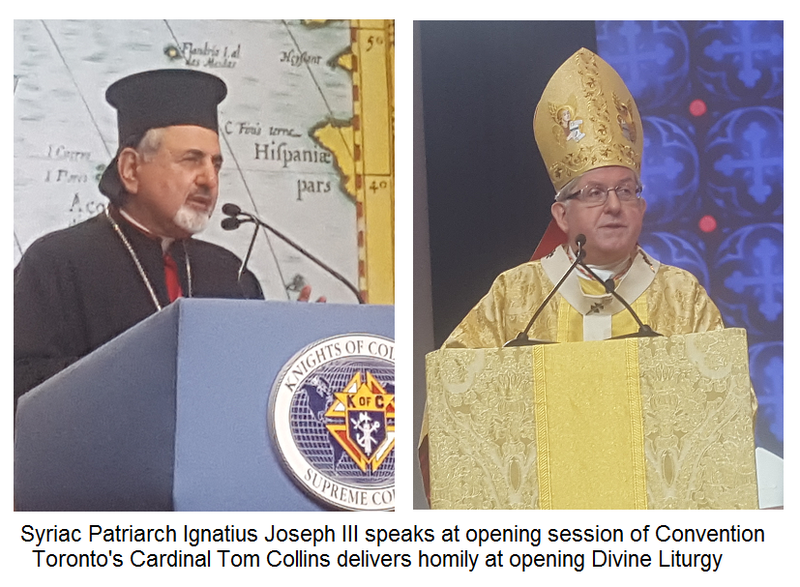 Day two of the 134th Supreme Convention of the Knights of Columbus began with one of the cornerstone events of the annual gathering - the opening Mass. This year Cardinal Tom Collins, Archbishop of Toronto was the main celebrant and homilist. He was joined by 25-year Knight, Patriarch Ignatius of Antioch from Lebanon, a number of other Cardinals and Bishops and a large number of Priests and Deacons. The Grand Ball Room of the Sheraton Hotel was filled. The Knights set up a high-tech layout of video screens, lighting and sound systems that turn a convention centre hall into a “basilica”, surrounding the participants with inspiring artwork. The liturgy was very well planned and executed from beginning to end. 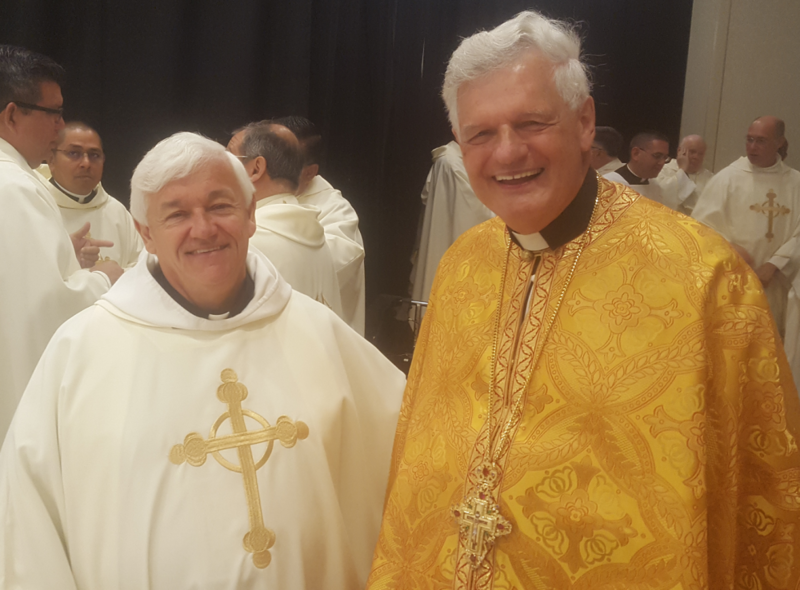 There are 12 Eastern Catholic bishops in attendance – including 4 Ukrainian Catholic Bishops and 6 from the Middle East and a number of Eastern Rite clergy - 5 Ukrainian Catholic priests from Winnipeg, Edmonton, Kyiv and Lviv and a subdeacon. The clergy were invited to a special luncheon with the supreme directors and other dignitaries at which Supreme Knight Carl Anderson unveiled a painting of Blessed Mother Theresa – the image that was chosen as the one to be used at her canonization ceremony next month. On hand to help Carl Anderson with the unveiling was Fr. Brian Kolodejchuk, MC a priest formerly from Winnipeg, who is the superior of the Missionaries of Charity (the order of priests founded by Mother Theresa) and who spearheaded the process that led to Mother Theresa being declared a saint by Pope Francis in Rome on September 4, 2016. 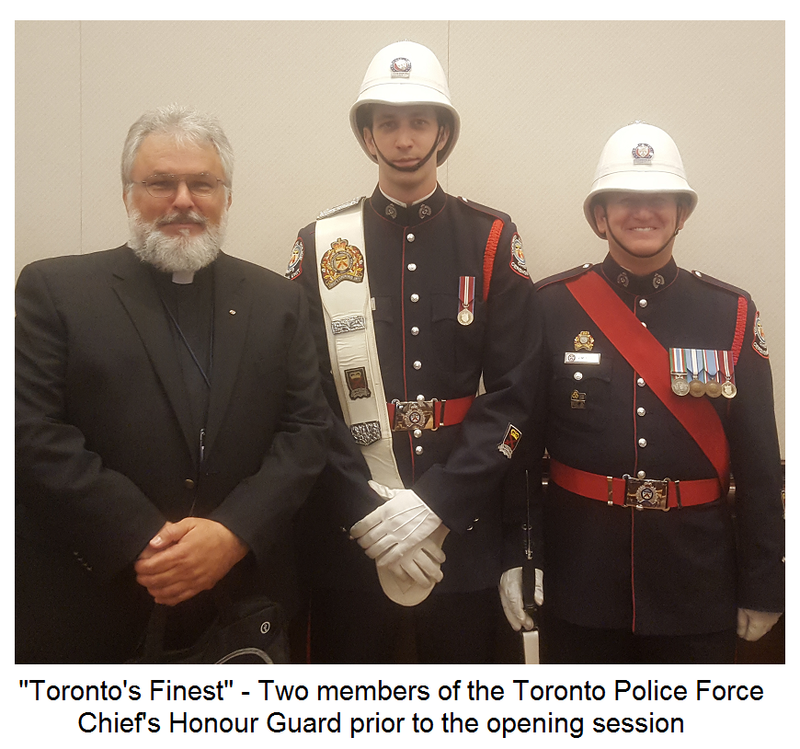 Just prior to the Supreme Knights Report, the flags were brought in by the an honour guard of the Toronto City Police and greetings were read from Pope Francis and a number of heads of state and governmemt leaders. 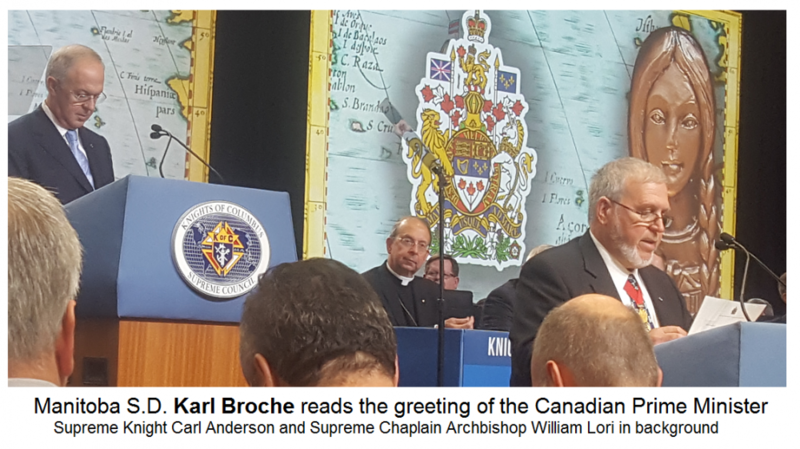 Manitoba State Deputy Karl Broche was asked to read the greeting sent to the Convention from Canada's Prime Minister. Standing ovations were given for the delegation from Ukraine that has, in a few short years, welcomed about 560 members into 15 new councils with an overseeing “Territorial Council”. The evening event is the gala “States Dinner” featuring a keynote speaker and recognition of the state councils representing 1,918,122 Knights of Columbus around the world – Ukraine, Lithuania, Poland, Puerto Rico, Mexico, the Philippines, Dominican Republic, Guam, the United States and Canada. This is to take place at the Allstream Centre. After the meal, there will be another working session in the evening….